The two-handled urn-shaped vase with eight spouts on the body and seven on the cover. 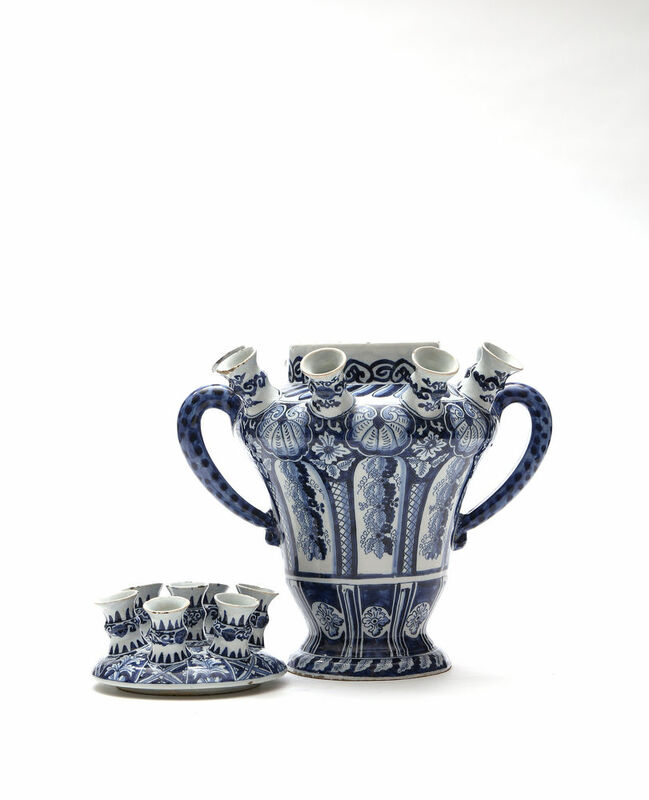 The only other vases that relate closely in form and decoration is the one in the palace of Het Loo (lacking a cover) and the pair of slightly smaller vases preserved at Schloss Favorite near Rastatt. The Schloss Favorite vases are marked AK for Adriaen Kocks, we believe that our vase, which was acquired in Germany, is part of the same group. The Schloss Favorite vases are accepted to be gifts from William and Mary to the Markgraf Ludwig Wilhelm von Baden-Baden at the time of their successful meeting in London in the winter of 1693-94, and were brought back to his wife Sibylla Augusta along with a pair of Delft flower pots bearing the crowned WM monogram. King William was godfather to the first son of Markgraf Ludwig Wilhelm and Sibylla Augusta. Queen Mary would have been aware that she and Sibylla Augusta shared a passion for ceramics. 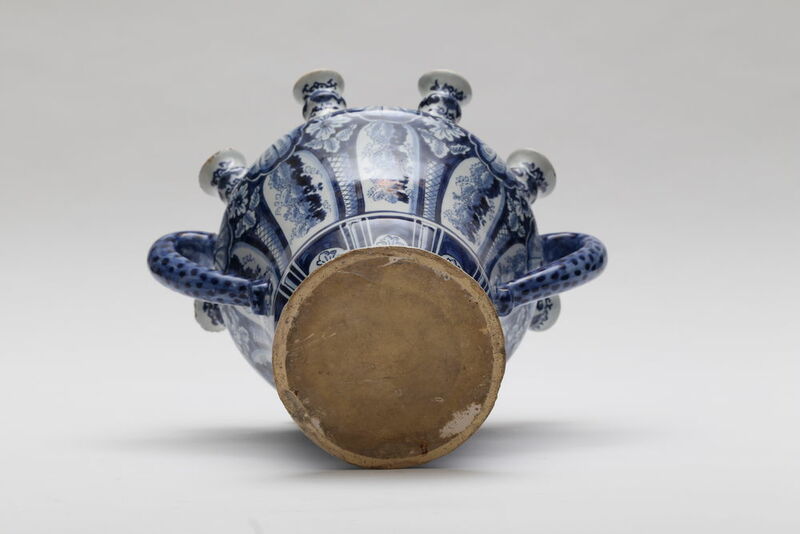 The shell motifs and pendant grapes are also found on some of the large tiles made around 1689-1694 for the Water Gallery at Hampton Court such as the example in the Prinsenhof, Delft. These four flower vases probably all came from Hampton Court. Condition – Restoration to a number of the spouts. Two chips to the underside of the lid and fills to four chips on the edge of the foot. A 2cm crack from the rim. A detailed conservation report available. Literature – A.M.L.E. Erkelens, ‘Delffs Porcelijn’ van Koningin Mary II. 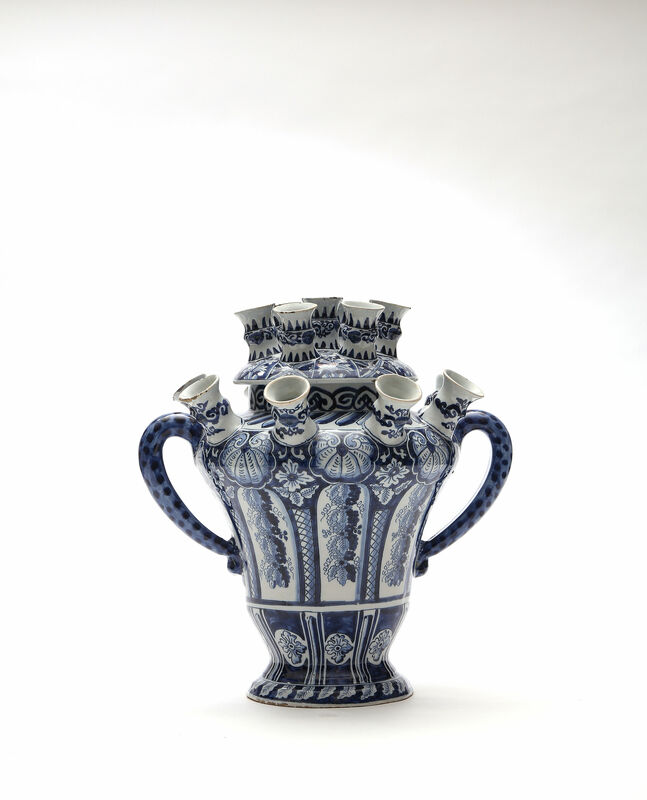 Ceramics at Het Loo from the time of William and Mary, (1996), catalogue no. 9. Ulrike Grimm, Favorite, Das Porzellanschloss der Sibylla Augusta von Baden-Baden, 2010, p. 128, plate 107. This item has been sold to the Birmingham Museum of Art, Alabama.